Eliminate the need for several different vegtable peelers with this compact design, which incorporates three essential styles of blades all in one unit. Made from high-quality stainless steel, its three blades are razor sharp and are housed in a tough,plastic,circular case. Simply select the desired blade-standard,serrated or julienne-by rotating the unit's brushed metal hub, until the desired blade is fully exposed. The Rotary Peeler makes short work of even the toughest fruit or vegtable skin and the design also includes a potato-eye remover. 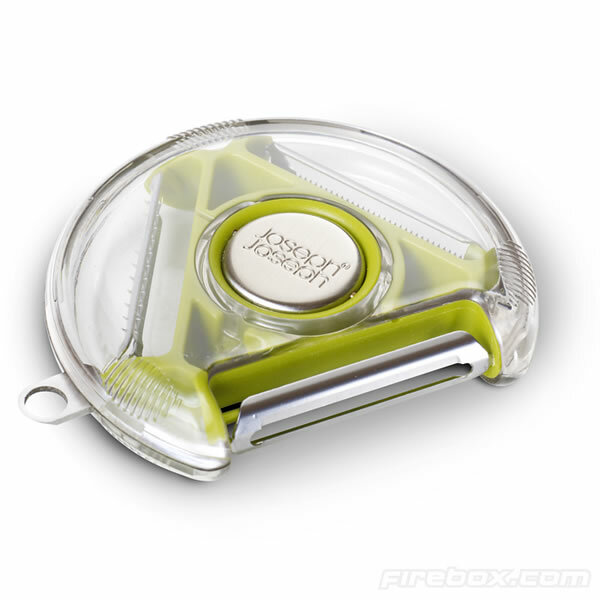 The case can be opened for easy cleaning and the entire unit is dishwasher safe.